This piece developed slowly. My stash of vintage household linens had grown too large but I couldn't part with any of the pieces ... even the stained or damaged ones. 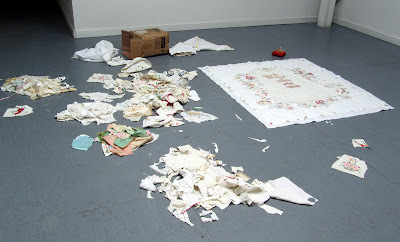 Someone had stitched these tea towels, pillowcases, table runners, and napkins. I cherished them. While visiting Elmwood Cemetery (which is only three blocks from my house), I noticed the tombstone erected in memory of unknown family members. There seemed to be a connection between the anonymous stitches and the almost forgotten burial site. The 1930s era child's slip sealed the mental design ... my vision for this work. I bought the slip in a "table lot" at Bill Mishoes' auction. The grave rubbing was made last Easter morning. The quilt was designed earlier this summer. I had my last studio assistant snip a pile of linens apart ... filling the box with just the sections containing stitches. The background is a damaged, vintage tablecloth. The "batting" is a piece of recycled acrylic felt ... from a outdoors shop ... once packaging material for a kayak on its way from the manufacturer to the local distributor. I clipped and arranged all these pretty embellishments around the garment. Then I pinned it. Now I'll have to baste it because I can't stand that many pins while I'm working. Plus ... this is the piece I planned on taking to Hot Springs National Park for my one month residency in August. 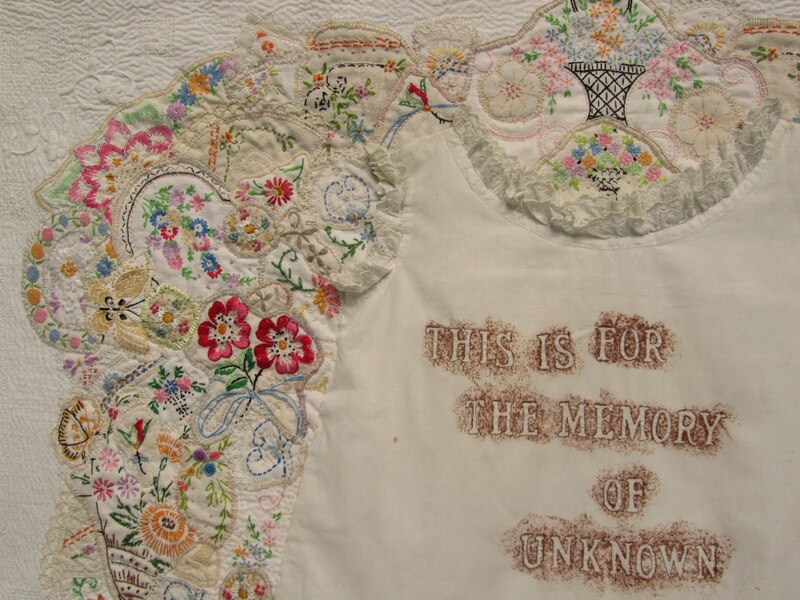 It seems like a perfect way to show the legacy of remembrance in stitches, my grave rubbing art quilt series, and also talk about the women who would have come in the heyday of the springs ... bringing their crazy quilts and embroidery with them for the healing experience of the hot waters. It took an entire day to baste this piece, and the work really was perfect for stitching in public while at Hot Springs National Park. 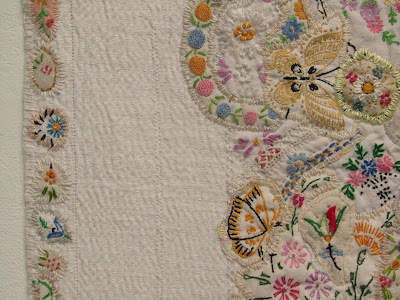 People loved touching it and remembering the fabrics from their childhood. 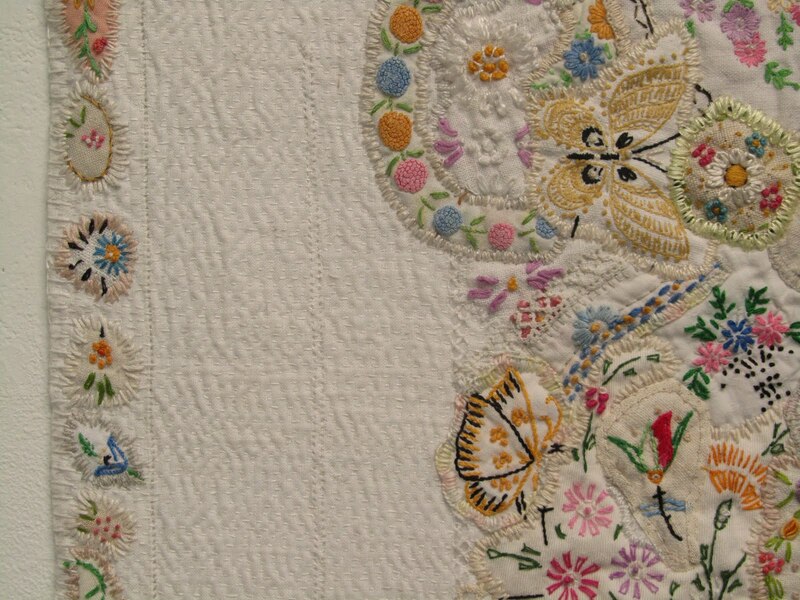 Between the central section and the edge, I plied dense running stitches ... consciously aware that this form of quilting is directly related to early West Bengal and Bangladesh kantha. Women layered their worn saris and stitched light blankets and other household textiles via the running stitch. It was a perfect thing to do while riding back from Arkansas and in the evenings in front of the television! After countless hours, the front was finished. The reverse was made of other vintage household linens. The edge is blanket stitched. I'm very, very happy with this piece. For me, it bridges history and it perfectly blends "traditional" with "contemporary" ... a modern art quilt made of 100% recycled fabric that sings of yesteryear without losing a present day viewpoint. This really is such a wonderful cloth. I adored it while it was growing under your hands. It is a fantastic way to imbed and preserve all these household cloths. And in that way kind of honouring all the stitching hands of years gone by. And yet so undoubtedly yóú, Susan! Bravo, this will look smashing on your solo show!!! I too am enamoured with the idea of all the hands that played a part in creating this wonderfully beautiful art quilt. 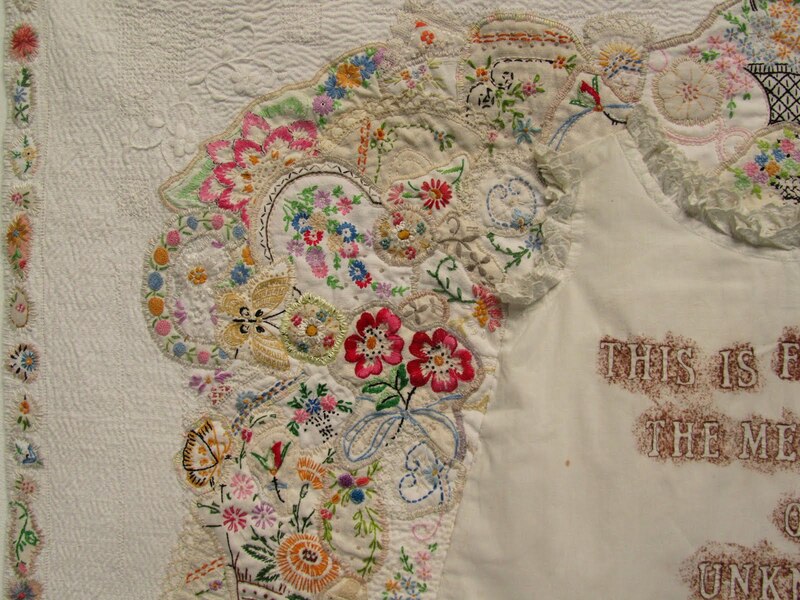 All the women who embroidered in front of fires, and radios...before TV was invented. I love the sense of history (herstory) in it holds. I am always amazed at the time and effort you put into these pieces too. I hope everyone who sees it on the blog blows up the photos to see the details. The lace on the little slip was only seen by me this way. Susan, something else! My new copy of Quilting Arts arrived and I opened it up and saw YOU immediately in the wonderful article they did on you and your stained glass pieces and gravestone rubbings. What a wonderful article!!! They photos are terrific! And I think really show your work well. You can be so proud! 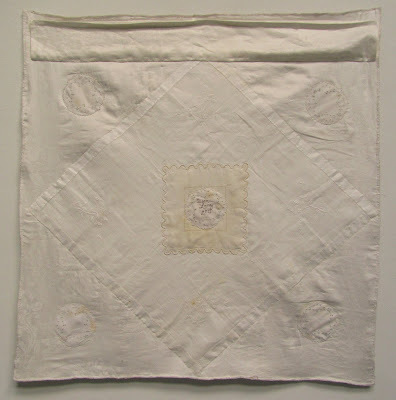 Your pieces with vintage linens inspire me. I have inherited a stash of them -- many also stained but with embroidery and/or crocheted lace intact. They have yet to tell me what they want to become now, how they want to spend the rest of their days, but each time I see what you are doing, I hear their voices more clearly. Soon, very soon, I'll be able to make a start. Lush, beautiful cloth with a story...my favorite combination! Good on ya! 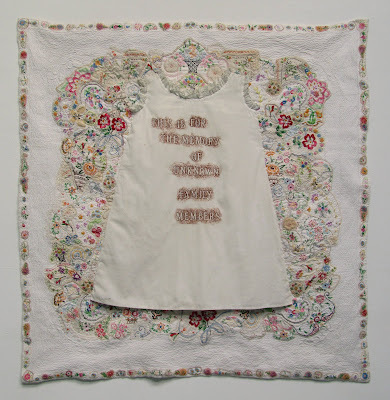 The piece is so excellent and lord, all those tiny stitches, go girl. Love it, and seeing your work. Enjoyed reading of your adventure in AR. as well. The pictures do not do it justice but are so lovely. 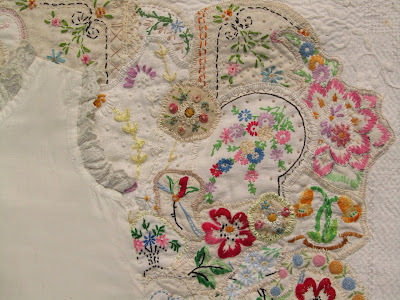 I am so happy that I have been able to watch you stitch this piece. Truly a keepsake of - you for you sons, perhaps. 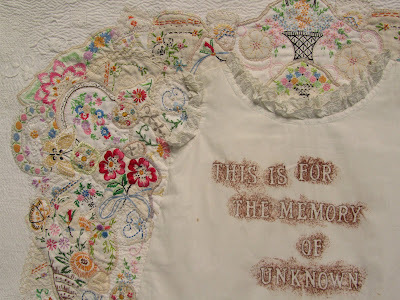 I adore the use of these old textiles and the enigmatic words too. What a truly incredible piece of work you undertook and you should be well proud of it! I am in awe and so moved by these pieces. specially by the thoughts and beauty of craftsmanship applied in such a beautiful way. connecting the heart and the hand. Thanks so much.